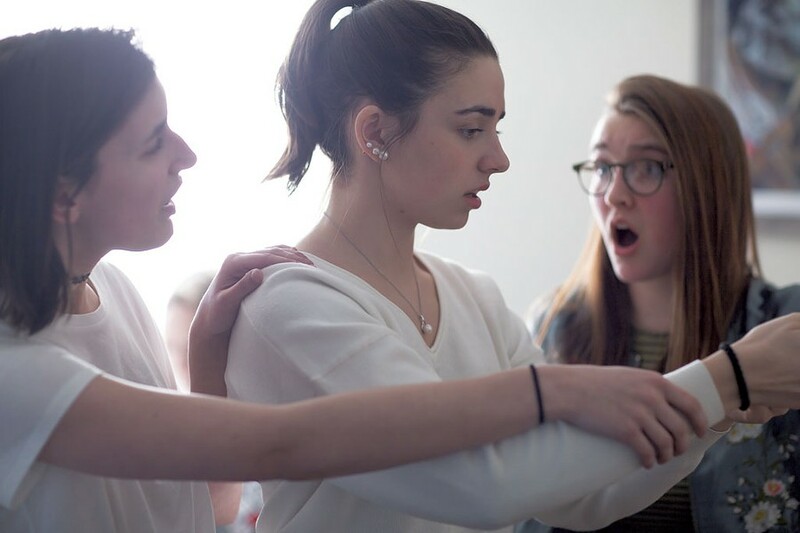 On a recent afternoon at Patchen Music Studios in South Burlington, four young female opera singers work out the finishing touches of a scene from Wolfgang Amadeus Mozart's The Magic Flute. They are so young, in fact — high school sophomores, a junior and a senior — that their voice ranges haven't solidified. But they sound impassioned and musically astute, and they act out the trio of Spirits surrounding Pamina like pros, albeit in leggings and braces. 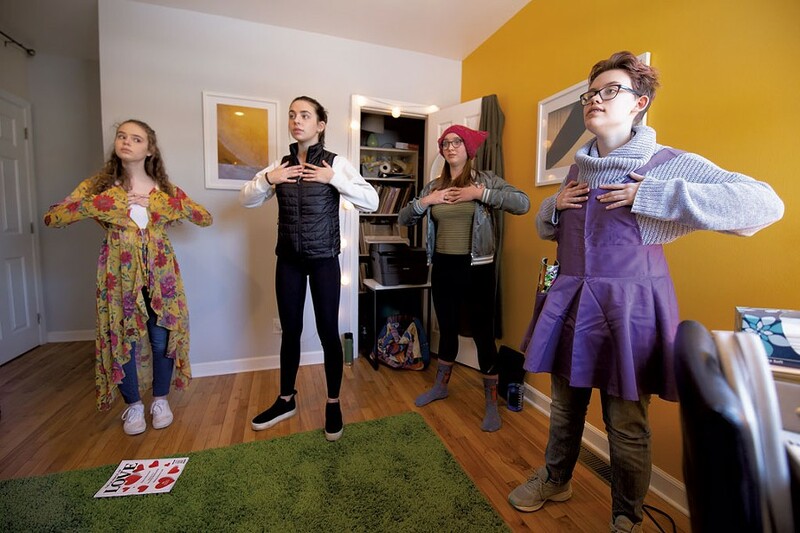 The girls are among the first participants in the new Youth Opera Workshop of Vermont, whose inaugural group consists of five girls and one boy from five high schools in Chittenden, Addison and Washington counties. YOWVT is a satellite program of the Middlebury Community Music Center. Its founder and director is soprano Sarah Cullins, a Vermont native and internationally experienced opera singer. After 12 weeks of training, Cullins' young singers are about to give two public concerts. Singing in English and Italian, they'll perform six scenes — one each from Flute, Henry Purcell's Dido and Aeneas and Claudio Monteverdi's Il ballo delle ingrate, as well as three from Mozart's The Marriage of Figaro. They will also star in abbreviated concerts at each of their schools, where the choruses will join the soloists on a prepared madrigal from Il ballo. Cullins has the perfect personality — smiling and bubbly — to make opera seem less alien to teenagers. While growing up in Burlington, she had a level of exposure to the art form that few Vermont students get today. "I grew up at a time when New York City Opera was coming to the Flynn every year," says the 45-year-old. In high school, while studying with local voice teacher Jill Levis, Cullins performed during the summers in the chorus of the former Vermont Mozart Festival's productions of Gilbert and Sullivan operettas. She continued to sing in them while a college student earning a double degree in voice performance and English at the New England Conservatory of Music and at Tufts University. By contrast, Cullins says, she recently took on a student who had only sung in musical theater, which didn't put her high voice to full advantage. "I said, 'Have you ever tried preparing a song for solo classical singing?' She said, 'No, I really want to be onstage and wear costumes and act and develop a character." And I said, "Well, there's this thing called opera,'" Cullins recalls, laughing. "I mean, how would she know?" Last fall, Cullins joined forces with Helen Lyons — another Vermont soprano who returned home after an international career — to help alert the state's students to the existence of classical singing, which includes opera, art song and soloing with orchestras. The pair visited nine Vermont high schools, sang for the students, talked about what opera singers do, and announced the upcoming YOWVT. Chloe Clark, a Middlebury Union High School sophomore, attended the singers' presentation and decided to sign up. She later began studying with Lyons. "I definitely love [singing opera]," says Clark. "It's something I'm not entirely used to — you're really acting. It's exciting." Clark will sing two of opera's most famous arias: Dido's suicide song at the end of Purcell's 1688 work, and Cherubino's aria about the misery and delight of love in Figaro, composed in 1786. The young singer has thought about how to relate to both of her centuries-old characters. Of Cherubino, she says, "I've never been in a relationship, but knowing what it feels like to have a crush, I connected with that kind of feeling." Clark's mother, Gaen Murphree, drives her an hour each way to rehearsals. Murphree, who studied theater directing in graduate school, volunteered to stage-direct two of the six scenes in the upcoming performances. (Cullins is directing the other four.) Murphree says that all of the scenes Cullins selected are delightful to hear but far from being "all rainbows and unicorns." The operas had political relevance in their day, and the students, she says, have come up with present-day corollaries, including the Parkland, Fla., high school shootings, self-harming and the #MeToo movement. Magner Amsbary, a 10th-grader at Champlain Valley Union High School, will sing her scenes in Italian. In one, she sings Susanna in the famous opening of Figaro, when her fiancé Figaro measures out a room for their future marital bed. In performance, Amsbary says, she'll be paging through a bridal magazine while Figaro, sung by Thomas Buckley, a ninth-grader at Colchester High School, consults a DIY magazine. Amsbary moved from the state of Georgia two years ago and began taking musical-theater singing lessons with voice coach Bill Reed. She also performed in school musicals and with Very Merry Theatre, a Burlington-based musical-theater program for children and teens. When Amsbary switched to studying classical singing with Lyons, she says, she found the technique "less different than I expected." The difference is that "show tunes use more belting in the chest voice; this is more head voice," Amsbary explains. "And there's more acting for me, because all the scenes I'm in are in Italian." Cullins notes that Vermont schools have "amazing" choral and musical-theater programs but few opportunities for individual training, and she hopes that YOWVT will fill that gap. Three Youth Opera participants are Cullins' students: Emma Greenwood, a Harwood Union High School junior who sings Pamina; Keegan Davis, a senior at Colchester High School who sings Marcellina in Figaro and the ingrate in Il ballo; and Buckley. Grace Lane, a ninth-grader at U32 High School in East Montpelier, studies with Maggie Cook. Greenwood, an enthusiastic musical-theater participant, found Cullins when her freshman choral director encouraged her to attend a vocal-technique workshop the soprano gave at a Vermont American Choral Directors Association event, she says. Now a junior looking at colleges, she's interested in majoring in vocal performance. "Opera is definitely the way I want to go in my life," Greenwood says. Meantime, participants of the fledgling YOWVT will have a starry near future. The workshop will hold auditions for three Spirits to sing in a September production of The Magic Flute by Barn Opera, a Brandon company headed by tenor Joshua Collier. In October, a handful of singers will be chosen to perform in the annual Middlebury Song Fest. The semester will conclude with more public and school concerts. Greenwood hopes to puncture her classmates' stereotypes about opera. "I feel like there's this stigma around it, like you make funny faces when you sing high," she says. Her face looks far from funny as she sings Pamina's part in the quartet with the Spirits. She thinks she has lost Tamino's love and, with an anguished expression, clasps a dagger in both hands. But the Spirits quickly intervene: One grasps her legs; a second stands at her side, a third behind her. Indeed, they have already foretold that danger will be averted, singing in an earlier trio, "Oh, soon, this darkness shall be brightened and human hearts shall be enlightened." That might describe the magic of opera. The original print version of this article was headlined "Youth Opera Workshop of Vermont to Give Inaugural Concerts"